Moisture in your attic is a common problem that many homeowners discover during a routine home inspection. Contrary to what many people think, the cold temperatures during the winter will lead to more moisture accumulation in the cold areas of your home. Typically, homeowners use fans and ventilation to prevent humidity moisture build-up during the warm summer months, but the winter is also a time you need to be taking preventative measures. The best solution for controlling moisture is to find the source. Moisture could be accumulating from clogged gutters, insufficient downspouts, foundation moisture build-up or even from air seeping in through your windows. Once you control any air leaks, make sure that you install the correct type of insulation with vapor barriers. These steps should be taken before you install any attic ventilation systems. The go-to solution of many homeowners is to only increase attic ventilation during the winter. Although this seems like an overall solution, attic ventilation during the winter can actually lead to an increase in unwanted condensation build-up because of a decrease in your attic’s temperature. The best types of ventilation systems are the ones with proper air intake and exhaust. Once your home is sealed properly, an attic fan will equalize the outdoor and indoor temperatures of your attic. The warmer air inside your attic is replaced with dryer air that prevents condensation and ice from forming. 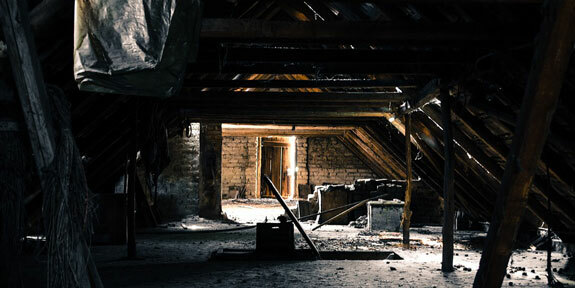 If you neglect to treat moisture in your attic, your home could experience mold and fungus growth, wood rot, insulation damage, or water leaks through the roof in your home. If your home inspector discovers a little moisture in your home, you should fix the problem immediately. If left untreated, the moisture could cause a lot of expensive damages in your home. Call Done Right for a thorough home inspection that can detect problems with attic moisture. Web Development By: Iowa Web Development. Web Hosting By: HostIowa.net. 2018 Copyright. All Rights Reserved. Done Right Home Inspection.